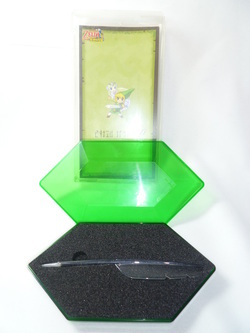 This collection focuses on the various keychains (that have figures/items on them only), cell phone strap charm, and other figures from the Zelda series. This will include styluses (with items on them or incorporated in their design), small item replicas, and other miscellaneous figures. 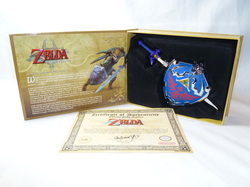 Other Info: The book that comes with this collection serves as the predecessor to Hyrule Historia. This collection also originally came with a 12 track CD soundtrack that is not included with mine. The book included with this set is also featured in my Miscellaneous Books/Booklets category. 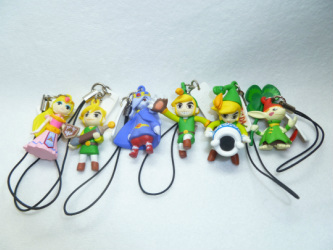 Other Info: These little keychains feature images of various items in the Phantom Hourglass title. 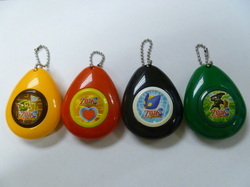 Each sound drop plays a short sound bite from the game when you press the large button on the face of the keychain. Most of the sound drops only have one track, however, the Phantom one has two. Other Info: These are a re-release of the Yujin 2004 charms. The figure appears to be the same, but does not have the little tag with the MC logo on it. Instead, (hard to see in the pic) there is this text on the back of them in gray: "TM & (C) 2014 Nintendo. 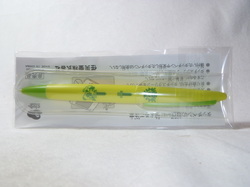 TOMY, SO40 3SA, UK T8862. China E2814WC1"
Other Info: Each of the Microland sets comes with three land pieces (that are puzzle-like and can be rearranged) and an 1" microfigure. The sets can be intermingled and used either in tandem or separately. This set includes some movable pieces as well, including a little door that opens on the hut and a lid on a treasure chest that opens. 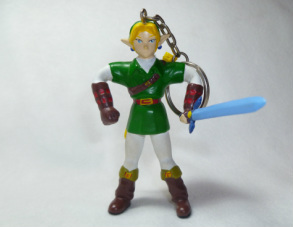 The Link figure pose itself has been previously released as a 2.5" figure through Jakks Pacific. 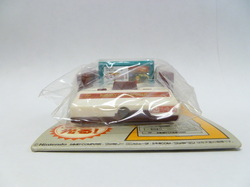 The 1" figure was later rereleased with the Microland Deluxe Set. A later microland figure set will be released with the same style, 1" Link figure as well. Other Info: Each of the Microland sets comes with three land pieces (that are puzzle-like and can be rearranged) and an 1" microfigure. The sets can be intermingled and used either in tandem or separately. This set includes a movable piece as well in the form of a little bridge that opens and closes. The Tetra figure pose itself has been previously released as a 2.5" figure through Jakks Pacific. A later microland figure set will be released with the same style, 1" Tetra figure as well. Other Info: Each of the Microland sets comes with three land pieces (that are puzzle-like and can be rearranged) and an 1" microfigure. The sets can be intermingled and used either in tandem or separately. This set includes some movable pieces as well, including a little door that opens on the castle wall and a lid on a treasure chest that opens. 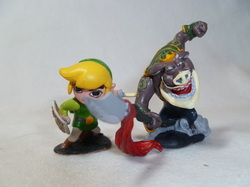 The Ganondorf figure pose itself has been previously released as a 2.5" figure through Jakks Pacific. The same pose was also used for the 6" figure that was previously released. A later microland figure set will be released with the same style, 1" Link figure as well. Other Info: Each of the Deluxe Microland sets comes with five land pieces (that are puzzle-like and can be rearranged) and an 1" microfigure. The sets can be intermingled and used either in tandem or separately. The sets can be intermingled and used either in tandem or separately. This set includes a movable piece as well in the form of a little bridge that opens and closes and the King of Red Lions' head is slightly adjustable from left to right. 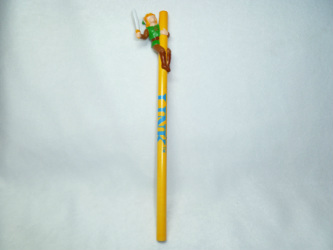 The Link figure pose itself has been previously released as a 2.5" figure through Jakks Pacific. The 1" figure was later rereleased with the Microland Deluxe Set A later microland figure set will be released with the same style, 1" Link figure as well. Other Info: Each of the Deluxe Microland sets comes with five land pieces (that are puzzle-like and can be rearranged) and an 1" microfigure. The sets can be intermingled and used either in tandem or separately. The sets can be intermingled and used either in tandem or separately. This set includes a movable piece as well in the form of a little door that opens on the hut. This is the first time we've seen a small Pajama Link figure through Jakks Pacific. A later microland figure set will be released with the same style, 1" Pajama Link figure as well. 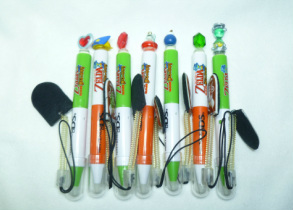 Characters: Toon Link, Toon Zelda, Ganondorf, Hylian Crest (Chase), Triforce, Hero's Shield, Green Rupee, Heart Container, and 3 Bombs. Other Info: This set was released pretty much under the radar in the States. The first gravity feed turned up at my local GameStop in December 2017. 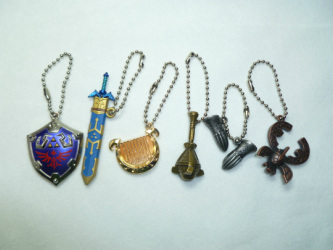 The set contains 8 main keychains and 1 mystery "chase" one (which is a golden Hylian crest.) 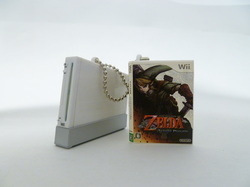 They were produced by Paladone, the same company who released the flat Zelda Backpack Buddies (featuring Wind Waker, Ocarina of Time, and Twilight Princess character artwork) in 2016.